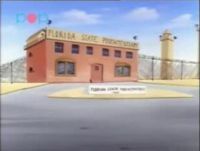 Florida State Poochitentiary is a dog pound located in Florida, either in or near the city of Miami. In The Adventures of Super Mario Bros. 3 episode "Life's Ruff", Luigi and King Windbag, who have been turned into dogs by Hip and Hop Koopa after they steal Windbag's magic wand, chase the Koopalings through a warp pipe to Miami to recover the wand. The two tail the them to a hotel, where they run amok and cause a food fight. While Luigi and Windbag try to stop them, Herman the dog catcher is called to capture them. Herman succeeds in capturing Luigi and Windbag while Hip and Hop escape in a stolen sports car. Herman bring Luigi and King Windbag to the Poochitentiary, where he places them in a dingy kennel with several stray dogs. King Windbag hates the atmosphere, and treats the other dogs very rudely. However, Luigi is able to cooperate with the other dogs, and with King Windbag's help, the dogs are able to form a pyramid, which Luigi uses to escape through a ventilation duct at the top of the room. In his quest to free the other dogs, Luigi watches a news report in Herman's office about Hip and Hop heading to Kennedy Space Center to hijack the space shuttle. After watching the news report, Luigi accidentally wakes up Herman and unintentionally hits the control panel, freeing all the dogs. With help from the other dogs, Luigi and Windbag escape and drive off in Herman's truck to stop the troublesome twins from hijacking the shuttle. This page was last edited on August 17, 2018, at 21:43.